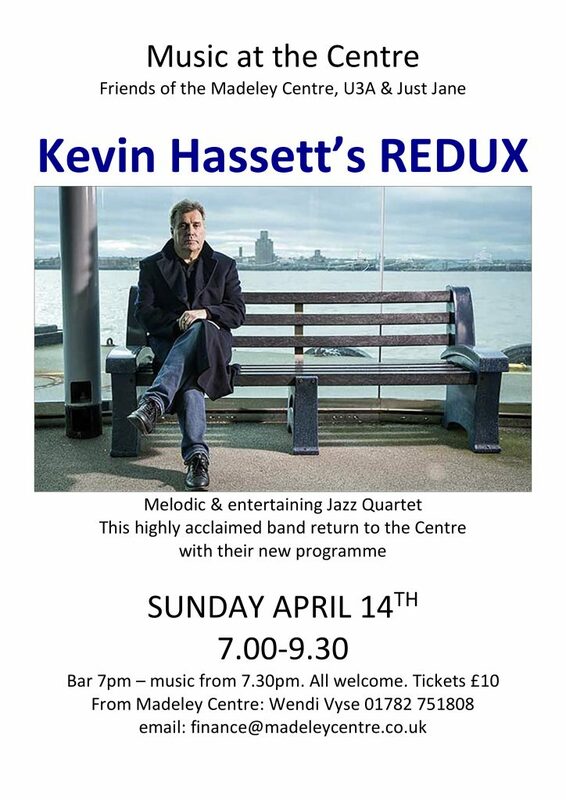 ‘Redux’ offers an energetic jazz based musical entertainment for both jazz listeners and non-jazz live music lovers. The repertoire is an eclectic, lively and original amalgam of freshly interpreted and arranged jazz standards leavened with blues and soul. The Band is a four piece featuring Kevin Hassett on vocals, well known local musicians Paul Matthews on Guitar, Jeff Henson on Bass and R.A Phillips on Drums and is a live spin off from the Studio based Project Kevin Hassett’s ‘A’ Game whose 3rd album ‘Rules of the Road’ was released in September 2017. This is available for download or streaming from the usual on line retailers. The album title track of ‘Rules’ is presently on the BBC London playlist and was featured complete with live studio performance on the BBC Robert Elms Show on 20th June 2018. Over the past 2 years ‘Redux’ had made regular appearances on the playlist of BBC John Hellings Show and a live studio performance for the show is scheduled for late Summer. Already this year the band has appeared at both Nantwich and Newcastle Music Festivals and has a full programme of gigs lined up to the end of the year.